A financial services provider wanted to promote its retirement advisory business, so it directed ads to people in their 40s + 50s who had recently bought books in the personal finance genre. Wisconsin’s Just the Cheese was able to achieve a 20% conversion rate (6m impressions / 22,000 clicks / 4,000 orders) by targeting Amazon users who they were believed were on keto diets (cheese is a very popular keto food). Our friends at York Athletics consistently see return-on-ad-spend (ROAS) over 2.5x. Google, Facebook, and Amazon are the titans of digital advertising, which are currently tallying about half of all advertising spend according to Jeffries analyst Brent Thill. He predicts Amazons ad business with grow at a compounded annual rate of 35%, which would put them on track to do $33 billion in digital advertising by 2022. He then goes on to predict Facebook, Amazon, and Google will combine to represent 72% of the digital advertising market by 2022. I hear marketers reminisce all the time about wishing they got into Google ads back in 2004. One of the best kept secrets in marketing is targeting people you know are a good fit for your product on Amazon. 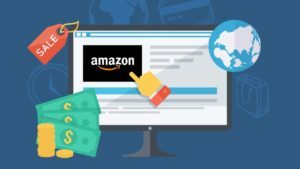 With recent efforts made by Amazon to lower spend requirements and open the platform up to more companies, now is the time to take the upper hand on your competition.